How Does The A1/A2 Debate Affect My Milk Choice? I grew up on fresh milk. From the cow to the glass. Papa taught me to milk before I was 7 years old. 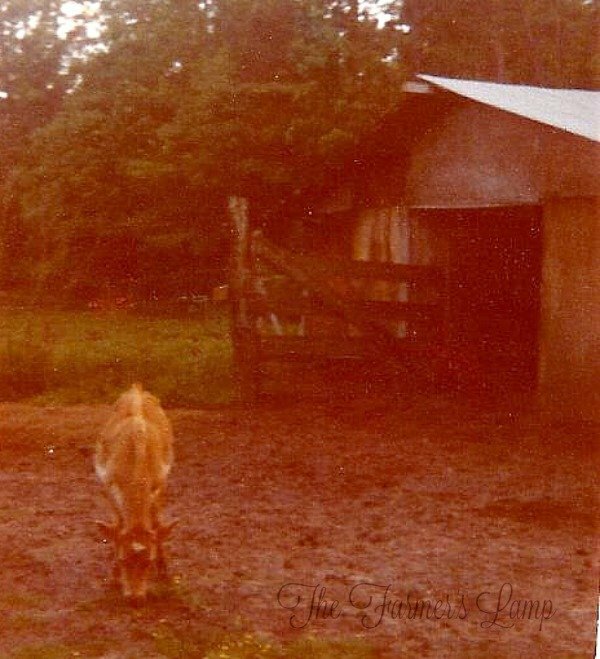 Betsy, the jersey milk cow was the first cow I milked. Who knew there’s a best milk for the body? I took for granted the goodness of raw, organic milk in the morning. For the last 30 years, there’s been a strong push to make us believe raw milk is not good for us. It’s even illegal in many states. We are told raw milk, which has been used since the dawn of civilization, is no longer safe unless it’s treated with pasteurization and homogenization. If we are to believe the advocates for the pasteurization of all milk at all costs, raw milk is as bad as rat poison. The fact is, the human race existed long before Pasteur was ever heard of and milk has been consumed in its raw form since the beginning of time. We should at least understand what pasteurization does. It sets out to accomplish two things: destruction of certain disease-carrying germs and the prevention of souring milk. These results are obtained by keeping the milk at a temperature of 145 degrees to 150 degrees F for half an hour. After this, the temperature is reduced to not more than 55 degrees F. Pasteurization does more than destroy dangerous germs, it also kills off useful bacteria at the same time. By subjecting the milk to high temperatures, nutritious components are destroyed as well. Sour, raw milk is still widely used in many countries. It’s given to invalids because it’s easily digested and is a good laxative without many of the common side effects of modern medicines. Pasteurization kills the lactic acid bacilli. This means the milk cannot sour naturally but instead decomposes which allows unwanted germs to quickly multiply. Since I was raised on raw milk and my ancestors relied on it for so many of their dietary needs, we believe raw milk, having a longer and better track record, is the best milk for our family’s health. As with all the things we talk about, you have to make the best decision for you and yours, I am simply saying it works best for us. However, the best milk issue goes deeper than simply raw milk vs. pasteurized milk. What do I mean? Well, it all starts with what kind of cow you get your milk from. Over the years, I’ve been told by friends visiting from other countries: “American milk will make you sick.” It turns out they could be onto something. More and more research suggests many of the 1 in 4 Americans who exhibit symptoms of lactose intolerance could instead be unable to digest A1 milk. What Does A1 and A2 Mean? I’m not a milk scientist, but I can tell you what I have studied and read. I met and talked with a man who worked with the State of Idaho dairy farmer’s. His job was to help them establish healthy herds and pastures. As part of his job, he educated them on the importance of breeding and buying A2A2 cows. Basically, the solids found in cow’s milk are composed of fat, protein, lactose and minerals. Beta-casein is one of six milk proteins and is produced by the CSN2 gene. Twelve genetic variants of CSN2 are known to cause changes in certain amino acids in the beta-casein protein and alter its properties. These variants can be classified into two groups, A1 and A2. These variants code for different amino acids at one specific site in the gene. Too technical for me, but I get the general gist of what he’s saying. When researchers first categorized the exact makeup of Beta Casein protein, the first one was numbered A1. Later, a chain was discovered which had a difference in the 67th amino acid and it was numbered A2. When tracing the genetics, it was discovered that the A2 gene was in fact the original and the A1 gene is a mutation. We’re told this mutation originated unknown years ago in European cattle. There has actually been a total of 12 bovine beta casein variants found which are mutations of the original A2 gene. A1 is a protein most often found in milk from the high-producing Holstein cows which dominant most American and some European dairies. The A1 protein is much less prevalent in milk from Jersey, Guernsey, Scotch Highland, and most Asian and African cow breeds. With breeding and how it affects the results in offspring when you breed an A2/A2 with an A2/A2, there are 2 copies of A2 present. This means you have an A2/A2 offspring. When you breed an A1/A2 with an A2/A2 animal, there’s one copy of A2 present, 50% of their offspring will be A2/A2. A1/A1 has no copies of A2 present so their offspring is, of course, A1/A1. Whew! Did you get that? “We’ve got a huge amount of observational evidence that a lot of people can digest the A2, but not the A1,” says Keith Woodford, a professor of farm management and agribusiness at New Zealand’s Lincoln University. He wrote the 2007 book Devil in the Milk: Illness, Health, and the Politics of A1 and A2 Milk. He goes on to say: “More than 100 studies suggest links between the A1 protein and a whole range of health conditions” everything from heart disease to diabetes to autism. Though some people contend the evidence is far from conclusive, but isn’t this usually the case. Now, all this study and research has its place, but it doesn’t really carry that much weight with me. I feel this way mostly because for every study done by one research group, I can find another test result by another group which says the exact opposite. The A1A1 dairies, which dominate the American market, make their money selling millions of gallons of milk in the stores. The possibility of certain groups getting paid to put out studies and research with a predetermined favorable outcome is high. I would guess this happens more times in research than we would like to admit. So how do I know what research or book to believe on the subject of what the best milk is for my family? I listen to my own body. We did a blind taste test. My husband says we should redo it and video it to share with you. I’ll update this article and share the video when we make it. In this taste test, I was blindfolded. Then my husband poured three glasses of milk. One was pasteurized, organic milk we bought at our local grocery store; one was raw A1A1 milk we bought from a health food store 50 miles to the north of us; the third one was raw A2A2 milk purchased from a health food store about 40 miles to the east of us. Each time I was able to pick out raw, unpasteurized A2/A2 milk over raw, unpasteurized A1/A1 milk, and who couldn’t taste the difference between store bought A1 pasteurized milk when compared to A2/A2 raw milk? That’s really easy to do. As a matter of fact, it isn’t hard to tell them apart just by looking at the milk in the glass. I grew up on A2A2 milk and never had any problems. When I got married and moved away, we drank store bought A1 milk. I began having all manner of digestion related issues. I received a diagnosis of lactose intolerance from my doctor. I had never even heard of such a thing. He told me I would suffer with this for the rest of my life. You know me, I’m not one to surrender so easily to any “condition.” I did a 14 day cleanse and returned to raw A2 milk. I was no longer lactose intolerant! I’ve not had any problem again. What a relief! I love milk and all of its wonderful uses in the kitchen! Remember, you are what your animals eat. The best milk comes from grass fed cows. Not just any grass, but grass grown in healthy, living soil. Nutrient rich pasture land makes for the best milk along with non-GMO grain. Cows fed this nutrient dense diet are, in my experience and opinion, the producers of the best milk to do the body good. 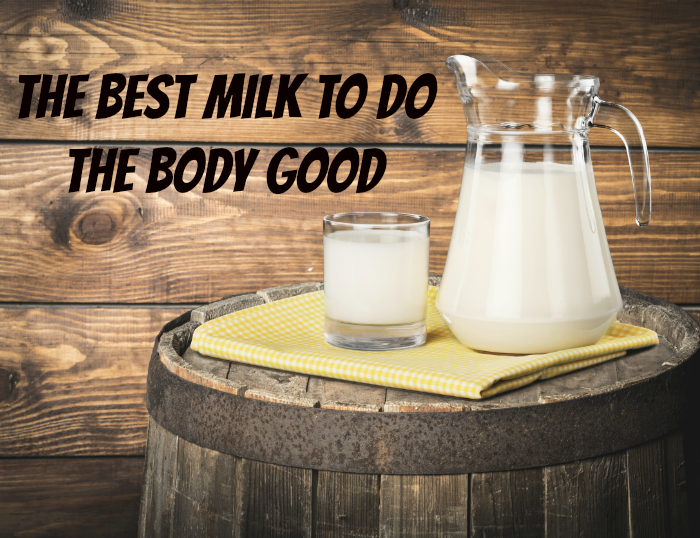 Is there a cut and dry answer to the question of what is the best milk for the body? For us there is, but we base this on our own experience. Like all things, you have to make the best decision you can for yourself and your family. After you make the decision, move on in confidence you did the research, you experimented yourself, and you made the best decision you could.